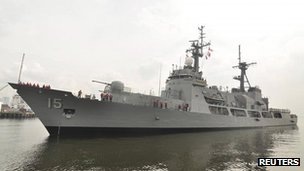 Photo Source: “The Philippines’ largest warship is in a stand-off with Chinese vessels in the South China Sea”, Reuters; See Philippines ‘withdraws warship’ amid China stand-off, BBC news, April 12, 2012. The maritime dispute in the China South Sea, according to recent news source, such as BBC news, between the competing interests of China and the Philippines recently almost broached the peace between these two nations. The dispute concerning issues of sovereignty over the South China Sea has a long history, notwithstanding the dispute over the East China Sea – the Senkaku Islands or Diaoyutai Islands (Diaoyutai Qundao). The Spratly Islands comprise about forty-five (45) islands. These islands are also occupied by military units from Vietnam, China, Taiwan, and the Philippines. There is even occupancy, though not a military occupancy, of an island by Brunei, which claims an exclusive economic zone (EEZ) (i.e., the Law of the Sea) in the southeastern part of the Spratly Islands. This time the dispute involves the commercial activities of Chinese fishing vessels. The area in dispute occurred in the the Scarborough Shoal in the South China Sea, which is on the northwest coast of the Philippines. After boarding the Chinese fishing vessels, two Chinese surveillance ships subsequently arrived in the area, and positioned their ships between the Philippine’s coast guard ship and the fishing vessels; thereby, preventing the Philippine’s coast guard from making arrests. “China should take more measures to safeguard its maritime territory,” the newspaper stated. In the aftermath of this incident, the dispute between China and the Philippines, as it has always been, is now a diplomatic dispute. In the way of background information, for the past year, the disputes on the sovereignty claims of China, Vietnam, and the Philippines have been growing in intensity, as each of these nations vie for much-needed resources. A problem for the international community is that the territorial disputes arising in the South China Sea are international in dimension, involve issues of international law (i.e., govern by the International Law of Sea), and affects many nations, including nations, such as the United States, which do not have a sovereign interest in the South China Sea. It is especially for this reason, the involvement, if any, of the United States in these territorial disputes present the potential for difficult problems, difficulties in U.S. diplomacy, and clear and certain potential dangers. For instance, a potential problem arises from officials in the Philippines seeking enhanced U.S. military support in the South China Sea against what many perceive as China’s new assertiveness in the South China Sea. Granted, U.S. Secretary of State Hillary Rodham Clinton did earlier announce, “We are concerned that recent incidents in the South China Sea could undermine peace and stability.” The United States has even recently expanded its military presence in the Asia-Pacific, such as the installment of a new military base in nearby Australia. However, whether the United States will militarily engage China’s seemingly new assertiveness in the South China Sea presents a potential for a crisis in U.S. diplomacy. There are problems with U.S. military intervention, the problem of growing economic interdependence between the U.S. and China notwithstanding, in support of the sovereignty claims of the Philippines. The most likely and dangerous contingency is a clash stemming from U.S. military operations within China’s EEZ that provokes an armed Chinese response. The United States holds that nothing in the United Nations Convention on the Law of the Sea (UNCLOS) or state practice negates the right of military forces of all nations to conduct military activities in EEZs without coastal state notice or consent. China insists that reconnaissance activities undertaken without prior notification and without permission of the coastal state violate Chinese domestic law and international law. The United States could also arguably find itself drawn into a China-Philippines conflict under the 1951 Mutual Defense Treaty with the Philippines. A problem for the Philippines is a U.S. diplomatic approach that maintains that it will not take sides in the sovereignty disputes concerning the South China Sea, while also refusing to comment on how the United States would actually respond in the event of Chinese aggression in the South China Sea. For the Philippines, this presents a problematic gap between Manila’s expectations and Washington’s policy view of its U.S. obligations (i.e., the 1951 Mutual Defense Treaty with the Philippines). Moreover, for many China’s geopolitical posturing regarding its sovereignty claims in the South China Sea is difficult to understand. This may well be due to many actually underestimating the diplomatic skills or the skills in geopolitical posturing of Beijing officials. Although Beijing persists in reminding all other claimant countries that the South China Sea is Chinese sovereign territory, China has been very careful about not officially demarcating its specific maritime claims. Thus, other countries can only infer China’s specific claims from Beijing’s statements and actions, and China retains the option to change or redefine its maritime border according to the situation (Dana Robert Dillon, U.S. Role in South China Sea Dispute, Paracel and Spratly Islands Forum, January 2008). As evidenced by this brief quote, Beijing’s statements and actions (i.e., a growing assertiveness) actually speak to a seemingly well thought out diplomacy or skillful geopolitical posturing. Additionally, at least for now, one reasonably suspects, especially in light of Washington policy position regarding U.S. obligations under the 1951 Mutual Defense Treaty with the Philippines, the United States will not employ military force on behalf of the Philippines to resolve the China-Philippines South China Sea territorial dispute. In other words, for now, the Philippines appear situated in an impasse between the balancing of Chinese geopolitical posturing against American geopolitical posturing. In the end, for today, the good news is that the dispute did not evolve into a “shooting” war, because the territorial dispute for the moment remains a war of words. All Rights Reserved by M. Ulric Killion, 2012. « Mitt, Bain Breaking the Glass Ceiling – Denies Being ‘Insufficiently Supportive’ of Women?